Okay, Google — help me advertise my items in Google Shopping! Everyone loves Google; we all know it’s the best way to find information on the internet. But when it comes to your Google AdWords Shopping Campaign, you shouldn’t treat Google as a friend. With a Shopping Campaign, it’s tempting to listen to Google when they recommend increasing your product bids when you have the budget. Their representatives and help topics will often show you benchmarks and recommendations that promise large increases in traffic if you increase your product bids by $0.01, $0.05, $0.10, or more. Some areas in paid search are forgiving when you overspend. 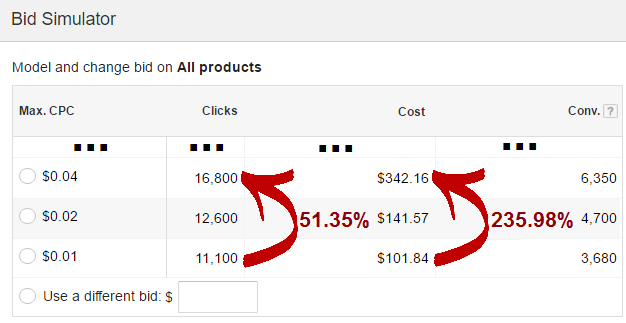 However, Google Shopping is not one of the areas you want to overpay for your traffic. Shopping Campaigns in Google AdWords can (and will) take any extra money that you approve, but this extra spending may provide only very marginal gains. Google often shows benchmarks and recommendations when you are setting your product bids. 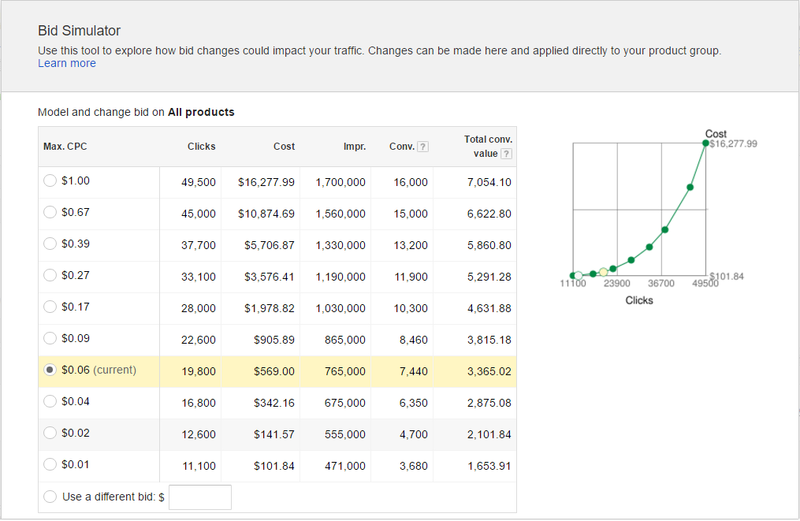 Below is an example of the bid simulator that is displayed in AdWords when set your product bids for Shopping campaigns. But once you’ve set your bids, you’ll probably receive a call from a Google AdWords “Strategist” who will have recommendations for increasing traffic to your campaign. More often than not, they’ll recommend that you increase your bids to drive more traffic. Or, you may have an “opportunity” posted in your AdWords account, which recommends spending more and increasing your bids (maximum CPC). Our case study involves Google Shopping campaigns which include products that were performing well at low bids of $0.01. Google recommended increasing the bids to $0.02, $0.05, or $0.10 to increase traffic and conversions. To check the validity of these recommendations, we set up a case study during two of the busiest weeks for e-commerce holiday shopping. For the week of November 27-December 3, 2016, we followed Google’s recommendations to double our bids. For the week of December 4-10, 2016, we returned the bids to our original CPC. Our daily budget was set far beyond the threshold expected for bids at either price point (in other words, budget was not a constraint). The results showed that Google’s recommendations provided a slight rise in clicks, but a high increase in both cost and cost-per-conversion. Across all of our case study products, the Google recommendations provided 424,403 clicks, for a total cost of $7,920, while the original bids provided 417,016 clicks, for a total cost of $5,150. In the end, Google’s recommendations produced only 1.77% more traffic — but increased costs by 53.78%. Cost per conversion rose from $0.98 to $1.43 from the penny increase in the bids. Note: consumer shopping patterns and competitors’ bids may have slightly changed across different weeks (week of Nov. 27 versus week of Dec. 4). However, historical data shows that these holiday shopping weeks deliver similar results. At the conclusion of our study, we discovered that simply increasing bids to drive additional traffic can result in overspending. The higher bids resulted in higher costs for ALL traffic – not just the incremental increase in traffic. 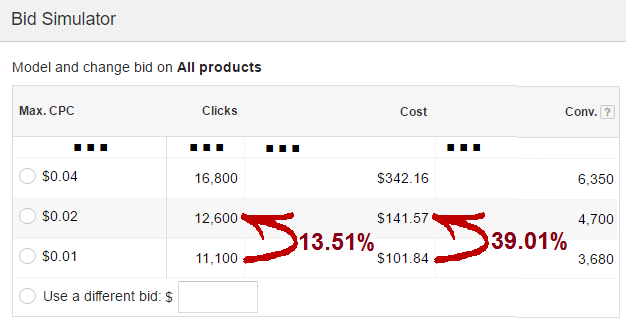 These results will change depending on the products in your Shopping Campaign. However, it is important to check the large increases in total cost when you follow Google Benchmarks. Compare the “Costs” column in the bid simulator when you increase your bids. And after you increase bids, make sure to check (and re-check) your actual results on a daily basis, to ensure the total costs are providing an adequate return-on-investment (ROI). Following Google Shopping benchmarks and recommendations without adequate tracking and optimization can quickly result in overspending! Would you like help with promoting your items without overspending? If you’d like to know more about how to optimize your Google Shopping campaign, and what costs are involved, please contact us for more information. We are here to help! ← Do Google’s Shopping campaigns work?